Services are an integral part of the Windows operating system. Many are critical, and disabling the wrong services can lead to broken functionality or even an operating system that is not starting up anymore. The majority of Windows users manage services from the build in Services Manager which they can launch with the hotkey Windows-r to bring up the runbox, the command services.msc and the enter key. This internal services manager is limited in many regards. It is for instance extremely cumbersome to list a services dependencies. A service can depend on other services, which means that it can only be started if the services it depends on are started as well. 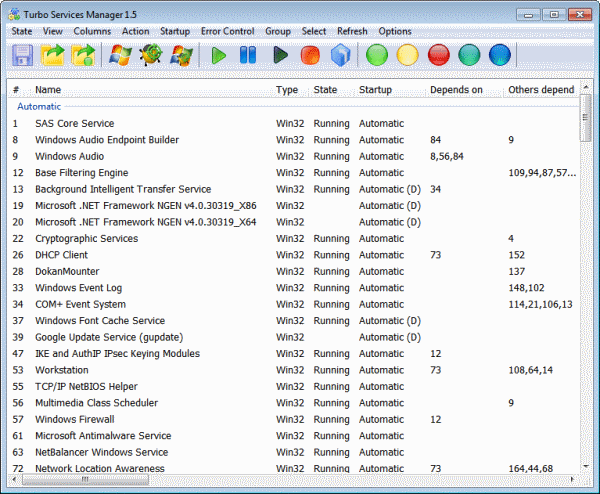 Turbo Services Manager is a free third party software that improves the manageability of services under Windows. I did review the program back in 2008, and felt that it is time for a new and updated review. One of the core differences to the default Windows Services dialog is the display of dependencies right in the main interface. Even better: Controls are available to select all services a service depends on, or services that depend on the service for efficient management. Another improvement is the ability to save the state of all services. This makes it possible to work with different services configurations on the same operating system. Handy if you want those networking features during the work day but not after work when you use the computer for private things. Service configurations are saved in XML files. The services manager can load them right away, or use a test load which displays the changes that will be applied if the configuration is loaded. Controls are also available in the icon bar to change a services state and startup. Even better, changing states and startup preferences can be done via keyboard shortcuts to speed up the process further. The program offers additional features, like the ability to display Kernel services. The developer has updated the program recently to support the new Windows 7 operating system. Turbo Services Manager is a handy program that is more effective than the default Windows Services management program. The program could use additional features, for instance integration of BlackViper's services recommendations for the operating system (like the Windows Services Optimizer SMART). Windows users can download the Turbo Services Manager from the developer website. The program is compatible with 32-bit and 64-bit editions of the Microsoft Windows operating system. When heavy data processing is required; nothing from Microsoft will do, use SAS.